When you picture your dream wedding, you imagine the beautiful bouquets, the hand-spun centerpieces, the amazing food, the bar, and the music. What you probably don’t envision is all the behind-the-scenes coordination that goes into planning these aspects of the wedding. It’s usually not as easy as finding a wedding venue and then having all the other details come together. In fact, it takes purposeful planning with vendors to make a dream wedding into reality. At Alegria Gardens in Katy, we’ve hosted thousands of wedding receptions and know first-hand how important finding the right vendors is. 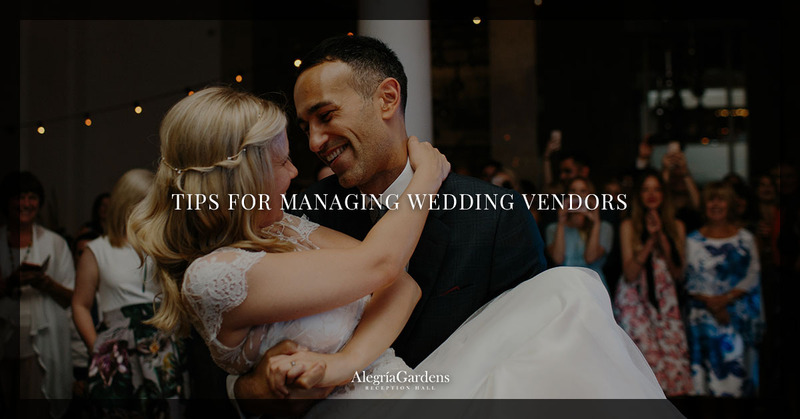 Check out this resource of tips for dealing with wedding vendors as you choose the ones for your wedding! It’s much easier to find the right wedding vendors when you have your exact budget planned out. This way, you know exactly what percentage of your budget you want going toward food, alcohol, location, flowers, etc. When you know you want to spend, say, $10,000 on food, it also becomes much easier to figure out what packages you can afford. That might be enough money to afford a buffet from the best vendor around, but it could also get you table service from a more middle-tier vendor. Whatever your price points, just make sure you have a firm grasp before seriously talking to vendors. Once you have your venue and date, it’s much easier to work with vendors. Trying to find vendors before having a date and location is like trying to build the roof of a house before the walls are up. Plus, many wedding venues have an explicit list of vendors from which to choose. This is usually a great route to take, as the venue and vendors already have working relationships. A caterer, for instance, is already familiar with the kitchen, room space, and other logistics that might otherwise make catering in a venue difficult. Additionally, a good wedding venue will only have relationships with good vendors. This means they’re already vetted and you won’t have to go through the hassle of choosing one vendor among a thousand options. It’s much easier for vendors to create what you want when you at least have an image of what you want. You might not be able to find the words for those burlap bouquets you want, but a picture will speak a thousand words. Images also make it easier for vendors to remember what you discussed. Instead of relying on notes from a meeting, they can look to the image and know exactly what to create. Alegria Gardens has two wedding reception venues conveniently located in Katy. As part of the grand opening of our second location, we’re also having a free meet-and-greet with our vendors! Come armed with any questions or ideas you might have, and see if our wedding hall would be the right venue for you.